You know that first perfect spring day after the endless winter? That cloudless day of birdsong, bike rides and bunnies; of budding flowers offering up their sweet stink to bees and passersby? That’s the day that makes many people fall (back) in love with Iowa City, and it’s the day we know the Farmers Market is near. Like many things in town, the Saturday Farmers Market has changed, getting bigger and more diverse. From 7:30 a.m. to noon, May through October, it’s still mostly contained in Chauncey Swan parking ramp, but you’ll find culinary row on Washington Street, adjacent to the ramp. Not only are there more purveyors of fresh produce, decorative items, potted plants and baked goods within the ramp, the number of prepared-food options has multiplied. On any given Saturday, hungry Market-goers can satisfy just about any craving: There is savory, eggy, ethnic, crunchy, doughy, healthy, sweet, fried, meaty … and there’s even local wine to chase it down, if that’s the kind of Saturday you want to have. Offerings may change throughout the year, as many vendors use seasonal produce and products whenever possible. Local Burrito, for example, features a market special burrito; egg and tortilla are always present, but each week, it’s accessorized with whatever looks best in the garden. A few weeks ago, mine had asparagus, green garlic and greens with homemade salsa. It was delicious, although perhaps a bit sparse on the veggies: There were bites that positively sang with their fresh green glory, and then bites of bare egg that held no music at all—and for $6.50, I want at least an aria, if not an entire symphony. But man, those green bites were virtuosic. The A.M. fries from The Box Lunch, a shiny food truck that’s pretty new in town, are a less healthy breakfast option. Served in a paper boat, these hand-cut fries are topped with grilled onions, orange cheese sauce and a fried egg, resulting in a sort of unholy breakfast poutine. Breakfast favorites at the Farmers Market abound. Friends swear by the lemon pancakes made by the lovely people at Griddle Me This, and others venture to the market just for the breakfast tacos from El Banditos. Much of the time, I base my selection on which place has the shortest line, because I don’t like waiting. But it’s clear by the lines at certain stalls that devotees don’t seem to mind waiting for their favorites. And part of the charm of the Market is saying hi to neighbors and friends, many of them in line, chatting and laughing while they wait. Because it’s so busy, service isn’t doting or extravagant, but the vendors do their best to serve their food with smiles and small talk; it’s clear they’re happy to be sharing their talents with Market shoppers. I have to admit that I’m not usually an early bird and usually don’t make it downtown until around 11 a.m., which is the perfect time to transition into lunch with a Maggie’s Farm wood-fired pizza. 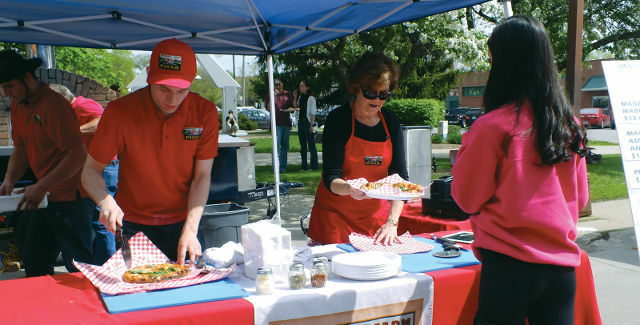 Maggie’s Farm is one of two Market vendors with portable wood-fired ovens, which they use to achieve sublime perfection in pizza form. The crust is perfectly thin and chewy; toppings are always fresh and sometimes feature market ingredients. And, Maggie’s Farm is right near Brass Ring Coffee, which has a pour-over setup for the freshest coffee at the market, so you can get a coffee while they make your pizza. When the pizza comes out of their scorching oven, you can sit on the curb, in the sun, while eating, drinking and marveling at the perfection that is your life at that moment. Even if you don’t want a full meal, you can grab a cup of coffee from Brass Ring, Café del Sol or Wake Up Iowa City, and sip and snack as you stroll the Market. Perhaps you need a doughnut for your coffee; there are a few to choose from, but every once in a while, two Amish women sell their doughnuts at a card table with a hand-lettered sign that says, “HOMADE DOUGHNUTS” [sic]. There are no words for the greatness that is these doughnuts, I promise. Every week, I comb the stalls looking for their fly-by-night operation, since they’re only there if another vendor backs out for the week, and there’s no way to know when the glorious doughnuts will be there. But maybe you’d rather have an Argentinean empanada from Maestro Empanadas for your snack. Or a spring roll, an egg roll or a crab rangoon from either Sushi Kicchin or Saigon Flavors. Or a little handheld pie from Burrowing Owl Bakery or IC Pie (I’m partial to the savory asparagus and mushroom tart), or a buttery rugelach from Regina Bread. Any of these will make your mouth super happy and fuel you for a long, convivial morning of milling, dodging, gabbing and shopping. Whatever you do, though, stop at La Reyna’s stand on your way out, grab a bag of corn chips and some guacamole or pico de gallo and go home. Try as hard as you can to wait to open those chips, because when you do, you’re going to eat all of them, and all the delicious dip you bought, too. I prefer to do this in my hammock, soaking up the flower smells and birdsong, reveling in the glorious wonder that is Iowa.